post hoc, ergo prompter hoc. 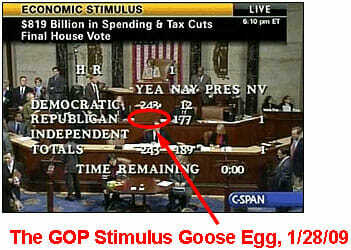 The economy is in recovery, therefore the stimulus did it. Since the stimulus package is responsible for the recovery, the Republicans are anti-recovery. Yup, that recovery package sure did the trick (NOT). Coyote, this is completely off topic but I think you will find this interesting. The Federal government is bribing people with borrowed money to buy houses and cars. The Fed is lending money for free and monetizing government debt. Friday the Federal government announced that it will require and additional two trillion ($2000 billion) in additional debt to operate. That is on top of already record peace time spending. After all this it is still not clear when the economy might actually start growing again. All the while the nation losses jobs each month driving medicare and social security to insolvency more quickly. I hope the american people are ingenious enough to create the wealth required to pay for and finance all of the spending over the next decade. We are going to need it. It might help if the current administration would stop attacking every industry that is profitable (even marginally profitable) and subsidizing (massively subsidizing) every one that isn't. Coke & Pepsi: drinking too much of either will make you fat and rot your teeth. 1) they have spent somewhere around 10% of the bucks, so if we're 'recovering' why spend the last 90%??? 2) Unemployment is still growing, and the trillions will have to be paid by someone somewhen. Who and when without a tax increase? To the left, all government spending (except military) is good. All the Republican representatives proved their evilness by not voting on a spending bill. The graphic is just fodder to stoke-up the rabid left-wingers. The fact that it ironically may help the Republicans with the center-right voters is irrelevant. Every government except the Swedish seems to think spending is great... There is an ongoing story about the Swedish government consistently refusing to help bail out Saab (I think it used to be a wholly owned subsidiary of GM) or help private buyers with financing to purchase it from GM. The finance minister essentially said (paraphrase): "Screw you, there is no way the Swedish taxpayer should have to take on your risk, if you can't find private financing it's probably because the risk is too high." Ah, the love of sensible policy. Though, let's not talk about the Swedish courts and their recent issues, there are some real problems there. Water. With a twist of lemon and an ice cube (no-cal and refreshing). Who the heck wants anything made by coke or pepsi anyways? Great - Ben Bernanke reappointed as Federal Reserve Chairman. President Bush appointed him first on the basis of his reputation as an Economist. Bernanke has been in office since February 2006. Would you say he has done a commendable job? I wouldn't. He has been in office for the years 2006, 2007, 2008, 2009. Unlike President Bush who chose him on the basis of reputation, President Obama has chosen Bernanke on the basis of his experience as Fed Chairman. So President Obama apparently thinks his policies can best be carried out by Bernanke's methods. Why would President Obama be "hawkish" on Ben Bernanke? In my opinion, it is because Ben Bernanke is "dovish" on inflation and has made statements in the past saying as much, although now that people are really listening closely, he says his comments were taken out of context. But read Bernanke's Book - "Inflation Targeting" and it is clear that he believes inflation in a good method of pursuing government policies. And under President Obama's plans, the government is embarking on a tremendous spending glut, and that will cause inflation, significant inflation. In general, when inflation occurs, income goes up, but not generally in real terms. In other words, income may go up, but so does the general price level. So even though there is very little "real" growth in income, it pushes individual taxpayers and companies into a higher tax bracket, thus increasing the "real" tax burden - and that is why it is called the "hidden tax" or the "inflation tax". The tax is real, and the inflation tax takes a larger percentage of income from the private sector and puts it into the government sector. And the tax increase tends to be permanent, because if deflation is a possibility, the government simply prints more money - thereby stimulating inflation. But eventually this system will crash as surely as all other Ponzi schemes eventually crash. Each cycle of inflation takes a larger chunk of resources out of the private sector and redirects it to the government sector. It grows the government and shrinks the private sector. So, when the government wants to raise taxes and grow government on the sly, inflation is the convert way of doing it. Now do you understand why President Obama likes Ben Bernanke.